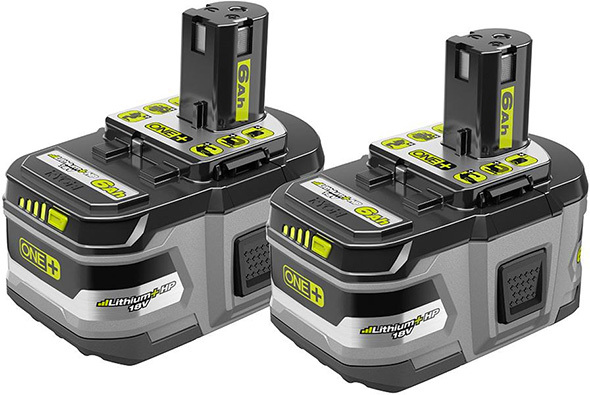 Ryobi’s 18V 6.0Ah cordless power tool battery packs are currently in stock at Home Depot stores around the country. Ryobi ONE+ introduces the latest in 18-Volt battery technology: Lithium+ HP batteries are designed with High Performance electronics for maximum power. For even more performance, use with Ryobi Brushless tools. The P164 ONE+ 18-Volt 6.0Ah High Capacity Lithium+ HP battery gives you incredibly high performance. This battery can withstand frigid weather conditions down to 14°F (-10°C) and is engineered to deliver fade-free power for maximum performance until the battery is dead. The 2-pack is very reasonably priced. There have been comments about the new batteries being larger than Ryobi’s 4.0Ah battery packs, while still being built with 18650 cells instead of the new larger cells that some other brands have been building into their highest performance battery packs. But let’s look at the sum of the parts, shall we? During holiday shopping seasons, Ryobi has sold 4.0Ah 2-packs for $99. That comes out to $99 for 8Ah total, or $12.38 per amp-hour of charge. With the current promo sales floor displays of 6.0Ah battery 2-packs, you get 12.0Ah for $119, or $9.92 per amp-hour. Hitachi dropped the price of their compact 3.0Ah battery packs, although I would consider Hitachi a higher-end brand. Kobalt has a 24V Max 1.5Ah battery pack for $10, 2.0Ah battery packs for $20, 4.0Ah for $50, and 5.0Ah for $89. This new Ryobi battery pack pricing seems even more enticing. Should also mention that it is currently “Ryobi Days”. When you buy their 3.0ah starter kit that comes with 2-3.0ah batteries, a rapid charger, and a bag for $99 you get a free tool up to $89 value. I’m a bit disappointed that the Ryobi days promotion doesn’t include any of the brushless tools. Definitely not as good as in the past. Although I guess having extra batteries is always useful. I didn’t include that since I already have it, but you’re right. Of the 3 stores I’ve been to recently, one has the 2×3.0 Ah battery + charger back in stock, and a different one still has the 2×6.0Ah batteries in stock . I’ll be doing the Ryobi days deal. 2x 3ah batteries will be very handy. I was getting close to buying the new 3 gal vac anyway so this is a no-brainer. Definitely. $10 extra for two 3Ah HP batteries and a charger? I wish I hadn’t jumped on the toolbox vac when it came out and had waited. Oh well. It is a little high pitched or whiny in my opinion, especially when you’re actually sucking stuff up, but good suction and good runtime, even with the 4Ah. The shape is a little funky but you get over that quickly (though I still prefer the smooth rectangle of like the Milwaukee toolbox vac). I use mine mostly for sucking up metal shavings while drilling, and taking it to clean the car or things going in the car if I’m going somewhere dirty. Thanks for the feedback. I don’t like the idea of a whiney vacuum but I think I’ll still give it a try and see if it bothers me. I have a feeling the size and features are just what I need. Worst case I’ll exchange it for a different bare tool. The new vacuum is pretty quiet. Suggest you Pass on the pole saw. Mine lasted about 2 hours worth of use. Motor started smoking even though the chain oil was full. Warranty is ueless as the repair place is 20 miles away. So 80 miles to hope to get a $99 tool fixed. Not really worth anything. Sorry about your luck on pole saw, i’ve had mine a couple of years now, got it after using the heck out of a friends for a couple days (he still has his too). I toyed with the idea of borrowing his mid extension to increase the reach but figured i’d be pushing my luck. 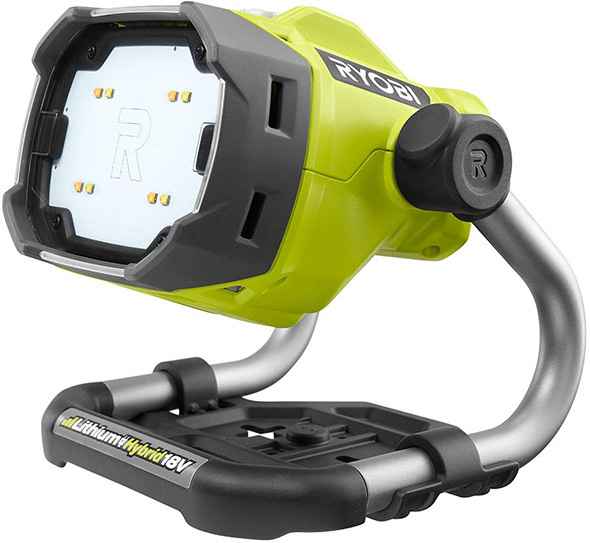 Really like it but with buying a lower end tool such as ryobi its not risk free. i’ve got a bunch of ryobi stuff, including stuff bought on craigslist and yard sales and haven’t had anything other than nicad batterys fail. Though i don’t push them as hard as my milwakee or makita stuff. The 9ah product page is up but not available yet. $179 for the battery and rapid charger kit. I wonder how long it’ll ta to charge that big old brick. The 6Ah batteries take 2 hours on the P117 “fast” charger, so likely 3 hours for the 9Ah, maybe a little less if they were smart and leveraged the parallel cell set design for charging as well. If Ryobi can make batteries that low priced, I wonder what other companies could do using the same cells. Even if they (say Bosch or Milwaukee) upped the quality of the battery packs to their standards, I would think it would not cost a whole lot more… That is, a lot less more than they charge. So looking at my ryobi 6 gallon shop vac, which is brushless, it doesn’t look like it has the two extra metal contacts like my drill for the extra brushless power. BUT, and here’s the question/interest, the plastic housing does look like it has the cutouts for those pins in it. Maybe they’re going to make a new version of it here shortly that can use the bigger batteries for more perfmance, but it wasn’t ready in time for that initial version? The Ryobi 6 gallon vac is not brushless, but they may make the next generation brushless to extend the run time and take advantage of the new batteries. Sorry yes, I meant not brushless, but has the cutouts in the housing for it, just no pins. The brushless string trimmer and chainsaw surprisingly don’t have the extra contacts either. Maybe there’s a disconnect between regular Ryobi and Ryobi Outdoor, but that doesn’t explain the shop vac. It may be that there is no benefit on the shop vac, that it may not need as high a current as some other tools. If it were redesigned with a more powerful motor maybe? Anyone know why the 3ah battery kit for the free tool promotion is no longer on HDs website? I went by the store earlier and all the battery kits that were out earlier were gone. I guess they still have it, per the Ryobitools.com website. It’s just been changed to an In-Store deal only, instead. Not really surprised the battery kits have all been bought. It’s a stupid good deal. I already bought one, and thinking of buying another to get the 6-port charger free. Ahh, that’s too bad. All the two-battery kits have sold out at our HD, and the only way to get a free tool now is to buy their $99 drill kit. That’s too bad. I need another drill like I need it to drill another hole in my head. Wait what, the 6 port charger is one of the free tools? I didn’t catch that…… Let me look again. Welp. Checked 2 different local stores. Sold out at both. Guessing the deal was a lot more popular than expected. Or massively abused online via bulk orders. Shame. Great way to get started into the system as a second battery platform. Also, side note. For anyone going into the store to use your military discount, the new ryobi 6ah 2pk are excluded. I thought that the 2 battery starter kit plus the 3 gallon vacuum (as the free add on tool) would make a good gift. So I looked online at my most convenient HD. Online ordering said they had 12 of the batteries and 8 vacuums. My online order (for store pickup on 5/17) went through. About 8 hours later (about 8:30 PM) I got a call from the store saying that they were out of stock on the vacuum, and asked if I still wanted the battery set (well duh no – not without the free vacuum) – so they cancelled the order. I went online again – checked the next closet HD ( about 1/2 mile further in the opposite direction). Online said they had 3 vacuums in stock. Despite some trepidation, my order for that store went through fine – and I picked both items up the next morning. My credit card was charged twice – but before I could dispute the double charge a credit appeared for the cancelled order. I think the bigger batteries will be nice for my Ryobi hot glue gun. I think they pulled it for some reason. I was in Home Depot Friday morning, bought one to get a tool and returned the batteries. A couple hours later I stopped in to get something for my girlfriend and checked again. They were all gone, there had been 10 an hour or so before but they said they had none including the one I returned. Got a two pack today. From one bar out of package charged quickly. Not much heavier than the 4 amp hour. . Hoping for blower run time improvement. I did manage to snag the special, in my case 2x 3.0 AH & charger (and I’ve been wanting another charger for months) and project vac (I’ve been wanting something like it for years), but it was a bit of an odyssey. I easily added both items to my cart, but HD’s web site wouldn’t let me check out because my store didn’t have any, and there’s no option to ship to store (only pick up in store OR express delivery from store). Well, I checked later, and voila! 2 in stock! Now I try to check out again, but get insufficient quantity–GRRR! So I head on over to HD, find the battery pack, but can’t find the vac. There’s a place in their promotional display for them, and the Pro Desk has the flyers, but no vac. I asked for help, and ended up with 2 dedicated people looking high (in the stocking areas above the tools) and low (in the various tool areas) with no luck for >15 min — until one of them found both vac’s in cart just outside the tool area. Vac is a bit whiney, but I can manage since it’s not too loud and suction is pretty good. I spoke to the tool manager at the store this morning and he said they are sold out everywhere. Apparently he says the only manufactured about 10000 for this deal. That’s pretty lame. I went 45 min to my closest HD and they were sold out of the batteries. I was just about ready to buy the 3 gal vac before I heard about this deal. Now I feel burnt by them and may not get it after all. I hope they realize this deal could be backfiring on them. Huge “Ryobi Days” aisle display with lots of bare tools but no batteries for the deal. Ask the guy in hardware to check what stores have any. I was able to find one of the stores about 45 minutes away that still had a bunch. Drove out and got one and my father go one too. They still had a couple vacuums too. It may depend on what area you live in. I’m lucky in Kansas City to have about 12 stores with about an hour of me. YMMV of course but it’s worth checking if you want them. FWIW I did talk to the guy at the store that did have them and he said they were expecting to get about 16 more in the coming week and he thought some stores other stores likely may still have more inventory en route. What I do nor understand is, they pulled the web page. They could say out of stock like they always do. The two 4 amp were out of stock for a long time but they left the web page up. Some thing is going on I think. Is there a problem with the batteries??? Home Depot’s motives for website and product page changes are rarely understood.